Many cats who've lost their teeth can still eat dry food. As they age, many cats lose teeth to dental disease and decay -- some even lose all of them. 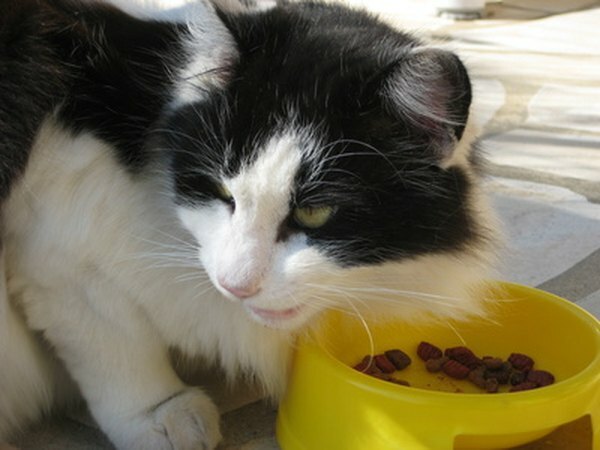 Your cat can still probably eat dry food after tooth loss, but it may take time to adjust. Some cats pick up feeding habits in the aftermath that require mealtime overhauls. Whether your cat is about to undergo surgery to remove his teeth or you've adopted a cat without any teeth, it helps to know how they got that way. As veterinary science advances, cats are living longer. This ups the wear on their teeth and increases their potential for dental health issues. The most prevalent of these is dental disease, according to Colorado State University's Veterinary Teaching Hospital. It leads to pain, tooth loss and a host of related health issues, and it's largely preventable. Cats can also lose teeth to contracted or congenital conditions. Your cat can still eat dry food after loosing his teeth, according to many veterinarians and veterinary educators. Feral cats and their wild brethren need their teeth for hunting and tearing, but domestic cats get by just fine with toothless munching. Some cats avoid food because dental issues make it painful to eat. The behavior may linger after tooth removal, and some people mistake the avoidance for an inability to eat hard food. You can help ease the transition back to regular eating by offering treats like tuna or catnip to get your cat interested in food again. Some toothless cats readily gobble down dry food, but perhaps too readily. 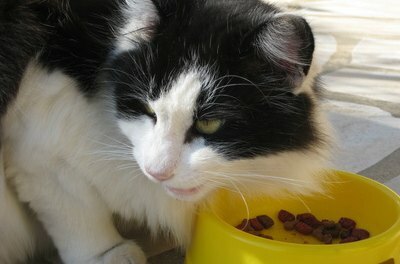 If your cat swallows kibble whole, without mashing it down, it may lead to gastrointestinal issues, including vomiting. Your cat may correct this behavior himself, but watch him carefully to make sure the issue is remedied. If it proves a chronic problem, consider mixing his dry wood with water or gravy to soften it up for him. If it's still an issue, try mixing wet food with his dry food or switching to wet food. More than 70 percent of cats show signs of oral disease by their third birthday, according to the American Veterinary Dental Society. Plaque buildup forebears this scourge, and there's something you can do about it. If your cat still has some of his teeth, brush them regularly -- daily, if possible. Introduce this new routine slowly, offering rewards as necessary. You don't need to worry about your cat swallowing the toothpaste. First, it's not toxic. Second, it doesn't have a foaming agent, so ingestion is less likely. Consult a veterinarian for more feline dental care information. Cornell Feline Health Center: Bad Breath -- Sign of Illness? What Does It Mean When a Cat Loses His Front Teeth? What Type of Cat Has No Tail? Does a Cat Need Its Tail for Balance? Is It Normal for Adult Cats to Lose Their Teeth?